Global war or global warming: which concerns you more? The question sharply divides Americans, a split that makes me fear for my country. The freest, strongest, most innovative and prosperous nation in history ought to know better. The twofold story line from the media and many politicians right now is that (1) we have been in Iraq too long for no reason, and (2) every day brings us closer to catastrophe from alleged human-induced climate change. The agenda is therefore to speed up the Kyoto-style self-flagellation while slowing the fight against jihadist Islam. This is utterly upside down. An unproved, slow-moving environmental worry is elevated to crisis proportions by our elites – while an avowed human enemy at the gates, committed to killing us by the millions and destroying the United States, is wished away. What folly. Both jihad and climate should concern policymakers and the public, no question. But the inverted priority we give them will astound historians (assuming the history is written honestly and in our language, not in Arabic under Sharia theocrats). How could these 21st century Americans be such fools and fainthearts, posterity will ask, that hypothetically higher sea levels frightened them more than nuts with nukes? We need to look hard at the American mind and the American spirit, summer 2007. A certain sleepy softness and unseriousness, a certain childish emotionalism, is evident in the national mood these days that does not bode well for survival in a dangerous world. You may be more convinced by Al Gore’s An Inconvenient Truth, I by Dennis Avery and Fred Singer’s Unstoppable Global Warming Every 1500 Years. You may feel your conscience pricked by CAIR, the Muslim lobby in this country, charging that Islamophobia is the ultimate terrorism, while I shudder at the jihadists’ deadly capabilities as documented by Lawrence Wright in The Looming Tower: Al Qaeda and the Road to 9/11. Fair enough; no oracle is final in such matters. Yet can’t we agree that an armed psychopath in our house is more of a threat than a finger raising the thermostat one degree? (Not that it’s certain any such human cause exists; it may be no more than a cyclical brownout of the planetary air conditioning.) And shouldn’t we admit that “in our house” is literally true, when it comes to thousands of Islamic radicals who have slipped across US borders and now stand to gain instant legalization under the Bush-Kennedy amnesty bill? Among our opinion-shapers and political leaders, passivity toward the illegal-alien invasion aligns roughly, though not exactly, with passivity toward global jihad. 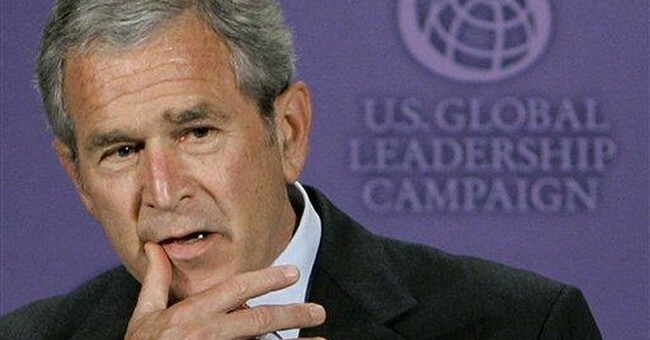 President Bush, unbending as he is on Iraq, still naively insists Islam is a “religion of peace,” and he misleadingly calls the battle against Al Qaeda and Wahabbism a “war on terror.” John Edwards now dismisses even this term as a “bumper sticker,” and his fellow Democratic candidates hurry leftward to keep up. Contrast this passive stance toward real people seeking to have their way with us (the jihadists by mayhem, the migrants by demography) to the hyperactive policies urged by many leaders on global warming – a theoretical threat supposedly justifying bigger government, vast expense, and widespread sacrifice. What you see is an American elite that has lost its nerve, its head, its soul, or all three. Ivan Denisovich, Solzhenitsyn’s everyman trapped in the Soviet gulag, observes that the resilient and defiant inmates survive but the groveling self-doubters perish. Societies are no different. A nation stupefied like some battered spouse with the half-notion that we had it coming, both as to jihad and Kyoto, is hard to be hopeful for. Whereas an awakened America, recovering its “Don’t tread on me” spirit, can defeat the Islamofascists as well as save the polar bears. Wake up or sleep on; the choice is ours.